This beautiful red and blue king style Nutcracker figure is a mix of traditional and modern styling. His bright red jacket features hand painted gold details and silver sparkling rhinestones. A black and white velvet cape drapes over his shoulders making him look majestic as he stands to greet passersby. His sparkling crown of red and gold has blue rhinestones for a special touch. 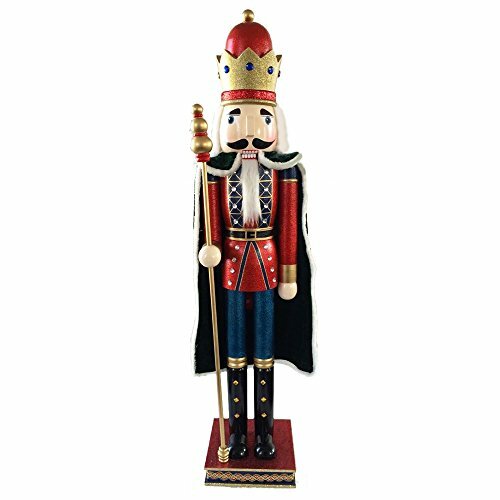 This large 42 inch Nutcracker king can stand alone or be added to other Christmas decorations. Display him at the door, fireplace, of where a special holiday touch is needed. If you have any questions about this product by Nutcracker Ballet Gifts, contact us by completing and submitting the form below. If you are looking for a specif part number, please include it with your message.